This store was created in an answer to prayer on how we can support Israel and her people/our people. To help explain to the Christian community their Jewish/Hebraic roots. To present the Messiah of Israel / Y'shua, our Redeemer, to the Jewish community. The Two have become One, in Messiah Y'shua. He has broken down the barrier wall. 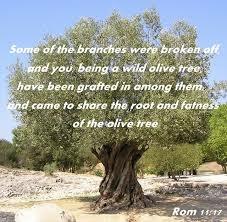 The branches can change, be pruned or cutoff, added or subtracted. But the Root stays the same. There is only one Root, that is Mashiach/ Messiah Y'shua/ Jesus. My name is Kent, my wife's name is Wendi. We have a wonderful family, great children and grandchildren. We live and work in a small rural town in the Midwest. Our town is a wonderful community to raise a family. We have a strong passion for the Jewish Messiah of Israel, Y'shua/Jesus of Nazareth. The Son of David, The Son of Joseph, The Son of Man, The Son of the Eternal our G-d. The Redeemer of the world. He is our everything. He is the central figure in all that we do. Through Him is the redemption from this present time ( this temporary world) to His eternal Kingdom to all who believe and obey. We are here to serve, if you have any questions feel free to drop us a line. If you are looking for something that we don't offer let us know, maybe we can get it for you. We are just getting started, we are small but we hope to continue to grow, serving our great King. King Y'shua ha Mashiach, and you our customer. To the G-d of Abraham, Isaac, and Jacob/Israel the Eternal be all the glory!